Okay, so this is a bit of a lie. It’s not reaaaaaallly a My Neighbour Errol. But it does involve a conversation with Errol AND it’s about the play I wrote with him so I’m putting it under this category. Because it’s my blog and I can do what I want! Ahem…anyway, so this week our play opens. 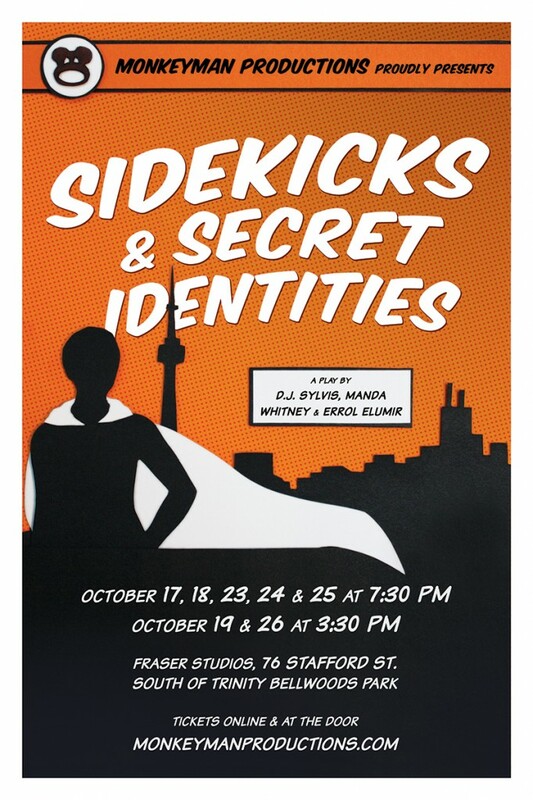 It’s called Sidekicks and Secret Identities, a collection of three plays about superheroes performed in one evening. Errol and I ended up doing a theatrical adaptation of our webseries. Opening weeks…are not my friends…they are in fact the worst thing for a naturally nervous person to have to endure. This experience has been especially odd in that basically my job for the show was done two months ago, and I have no clue how things are looking so far although I do know that I like the cast and that anyone who can handle Errol’s dialogue deserves a medal. At any rate…we’re opening. I’m extremely proud of this accomplishment, but with my personal pride comes all of the worst case scenarios that could possibly happen in a play, up to and including the audience throwing rotten eggs. 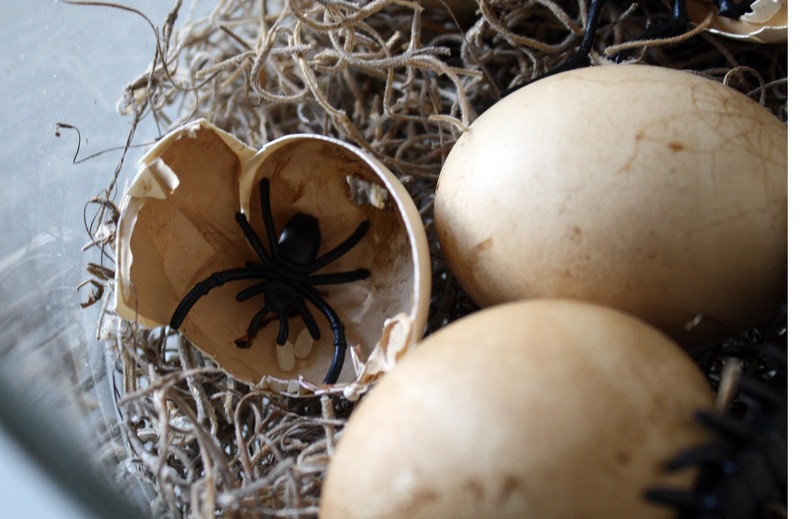 Or eggs with spiders! that would be TERRIFYING! Errol has now dealt with my nerves for every one of our projects. The worst was perhaps NaNoMusical, where I was certain we would be banned from the internet by angry NaNo fans everywhere. It wasn’t until he told me to log into a chatroom and see the reactions that I was convinced otherwise. Errol: Think about it this way. If you’re right, and the show does fail, I don’t get to be smug about it. Errol: But if you’re wrong, then I’ll be smug. Me: …I really don’t know how to feel about this. Errol: But if it fails, you get to be right! And I’ll be sad I can’t be smug. Me: So no matter what happens, I’m still going to feel bad and guilty at the end of it. 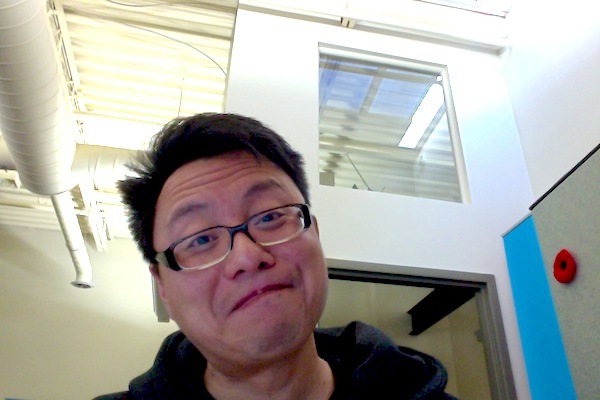 Errol: (happily) Yup! Have a good day at work! But yes…regardless of the “Errol is a smug jerk” story…we have a play this week. If you are in the Toronto area, you should come check it out. You can also check out a blog I wrote for Monkeyman Productions about some of the process here. If you would like to see Errol’s smug face firsthand, I would highly suggest coming out. Wish us luck! Posted on October 14, 2014, in My Neighbour Errol, Projects, Sidekicks and tagged monkeyman productions, sidekicks. Bookmark the permalink. 2 Comments. In the NaNoMusical your character was the one I related to most. I think a lot of people feel that same way. Your show is going to do great! And I think you’d be a little thrown off if Error didn’t get to be smug. Because worse than smug is the Error pout face.